Bayer Integrated Report 2016 - nexxar lab. Bayer Integrated Annual Report 2016. 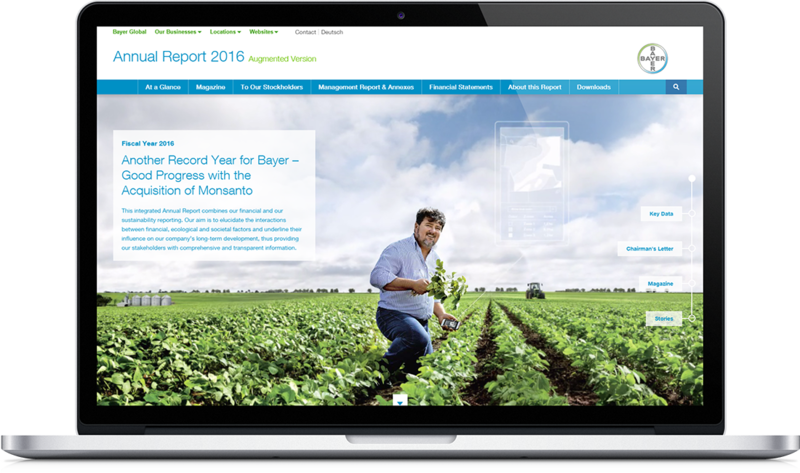 Having a horizontal scrolling page with parallax effect on last year’s landing page, Bayer relies on a waterfall page emphasizing four main topics in the current report. The first impression already invites to explore the new content. 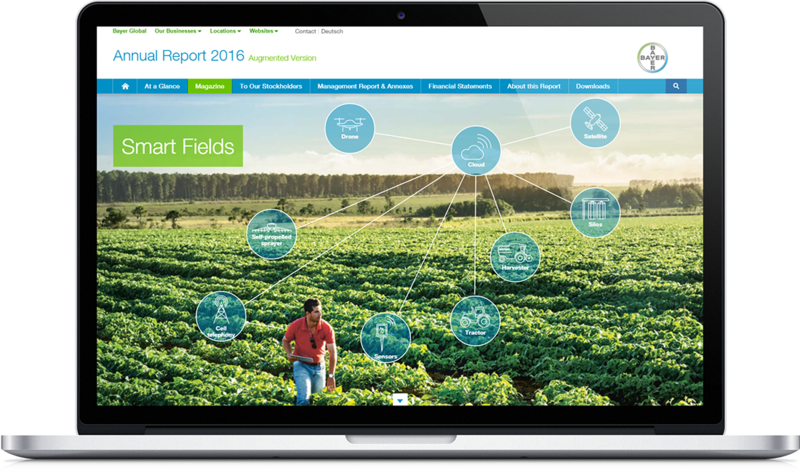 The key visual of the landing page shows a farmer on his field holding a smart phone in his hand. Implemented as a cinema graph, the clouds move across the blue sky which creates a fascinating depth and intensifies the impact of the picture. The effect and the motif arouse interest and point to one of the magazine stories: How digitalization in farming can help deploy resources efficiently and sustainably. On the right side an on-page navigation provides orientation by showing the topics of the scrolling sections. 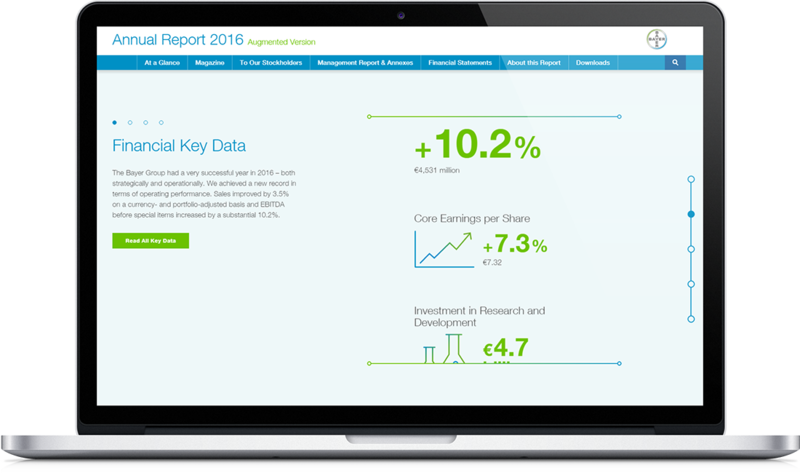 Within a split-screen concept the user explores the financial as well as sustainability and employee related figures at a glance or clicks to read details within the report. The figures and icons are animated and count or build up while scrolling. This is a very effective way to highlight the key figures interactively. The following sections also contain clear call-to-actions, e.g. to read the chairman’s letter or the stories of the magazine. Moving elements as well as a special video slider invite to dive into the report – which should be the intention of a well composed landing page. 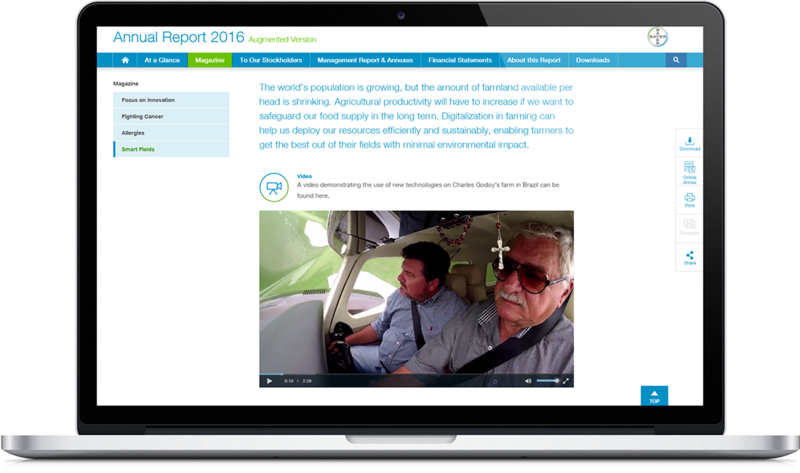 One of the highlights of Bayer’s 2016 report is the integration of several videos. A video message of Werner Baumann provides a wrap-up of Bayer’s performance in 2016. As he became Chairman of the Board of Management in May 2016, the video is a good way to address the stakeholders in a very personal way. The magazine contains three stories of Bayer’s researchers, patients and customers that illustrate the company’s work and achievements. Each story is told in text, pictures and elaborate videos – such as the one about Smart Fields: Modern farmers are using digital assets, drones or sensors to optimize their harvests. A video forms the introduction to this story demonstrating the use of new technologies on a farm in Brazil. Text and authentic photographs paint a realistic picture of the local farming work. Highlighted and animated figures enlighten facts or offer a foresight about the new approach. 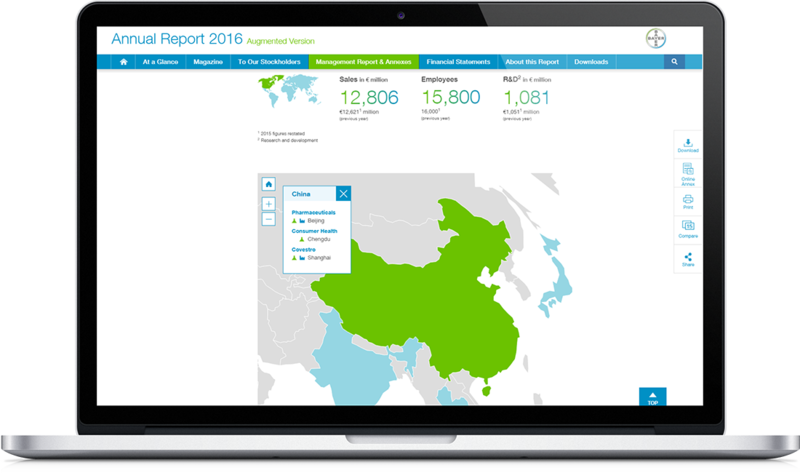 A design emphasize is also set on the presentation of Bayer’s worldwide actions: An interactive world map shows figures geographically clustered. To navigate, the user can either click on a tab or directly on the continents. Additionally, by clicking on a continent the map zooms in and reveals the countries of Bayer’s business activities. Throughout the whole report figures and icons are animated: Figures count up and icons are build up when entering a page or scrolling down. This effect is not only fun but directs the attention to key facts. Overall the 2016 report of Bayer is a far-reaching development compared to last year. We are curious about the next evolutionary step because one thing remains the same: After the report is before the report!